Milano : Arnoldo Mondadori, 1993. This paperback edition is an Italian translation of The Blessing Way, published in 1993 as number 2312 of the Il Giallo Mondadori series produced by Arnoldo Mondadori. The series was published weekly and has a two column format. This edition was printed for readership for the week of May 23, 1993 and contains a short biography of Tony Hillerman as the Author of the Week at the end of the book. 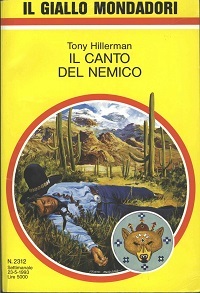 The cover is bright yellow with a full color illustration on the front, designed by Prieto Muriana. There is a useful summary of main characters in the novel listed at the head of chapter 1.